In today’s Egypt, millions are silent, nevertheless, they still remember. 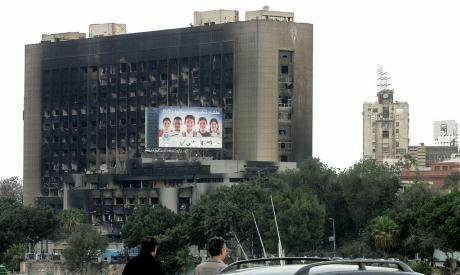 The burnt-out main headquarters of the then-ruling NDP-National Democratic Party in Cairo as seen from the Qasr al-Nil Bridge. Picture by Sherif9282 [CC BY-SA 3.0] source: Wikimedia Commons. Eight years back, young Egyptians were full of hope. On January 25, 2011, they rose up against Hosni Mubarak and triumphed. Mubarak stepped down and a military council assumed power until Mohammed Morsi was sworn in on June 30, 2012, as Egypt’s first democratically elected president. One year later, Morsi was swiftly deposed in a popularly backed military coup led by then-General Abdel Fattah al-Sisi. Ever since, the latter became the de facto – and since June 2014 the de jure – ruler of Egypt. The once-embattled ancien regime is back with full force. Not only to consolidate its power in the present, but also to control the past. Yet, since the outbreak of the January 25 Revolution, besides the Islamists, two distinct communities were – and still are – in conflict, among other things, over the revolution’s nature and principles: the regime and the revolutionary activists. What follows is an exploration of these communities’ strategies to permeate the people’s collective consciousness and to enforce their own narratives of the revolution and its memory, across three different domains: Egypt’s public space; Egypt’s online sphere; and outside Egypt. Over the past few years, Egypt’s urban spaces transformed from centres where democracy blossoms to besieged and militarised areas. Surrendering such spaces to the regime was not easy, for they were the centres where many of today’s young Egyptians have developed a modern identity. Following Maurice Halbwachs’ argument that symbolism (e.g. monuments or images) in public space can be (re)constructed by different social groups (publics), each producing a space that is representative of their community, it is obvious that, in the revolution’s early years, Egypt’s public space was representative of the young activists’ creativity and rebellion. Through graffiti on walls, images, texts and structures, the activists created from the country’s streets and squares memorials to keep the memory of the brave martyrs as well as the revolution’s ideals alive. Walls of Freedom, a 2014 book by Hamdy and Stone, offers thorough insights into the revolution and its artistic works. Young Egyptians’ independent cultural activities, including concerts and exhibitions, played a role in enhancing the historical narrative of the pro-revolution community. In fact, when activists managed to reach out to citizens on the ground, they succeeded to undermine the counter-revolutionary narrative and the regime’s collective memory field. A prominent example is the activists’ 2012 campaign: Askar Kazeebon (Lying Military) whose modus operandi was to broadcast videos and documentaries to pedestrians that falsify the military’s accounts of various events and expose the soldiers’ crimes and human rights violations that official and regime-friendly media ignored. Nevertheless, the regime was not idle while Egypt’s urban space is revolting. In Henri Lefebvre’s view, urban space is a social construct that is predominantly produced by a centralised power. Congruently, James Wertsch opines that, generally, the control of such power on generating and inoculating the narrative of the past in unmatched by that of any other social actor. It is barely disputed that the military, Egypt’s central power, endeavoured to restrict the public space and erase the memory of the January 25 revolution. For this power knows that while memories are linked to the past, they determine how many Egyptians will perceive the future. The military pursued 1984’s Orwellian prophecy: ‘he who controls the past controls the future’. One of the prominent monuments in revolutionary Cairo was the building of the former ruling party: The National Democratic Party (NDP). A historical building on the Nile Corniche adjacent to Tahrir Square and the Egyptian Museum. On January 28, 2011, during the protests, the building was set ablaze. The arsonists remain unknown, yet, the burned building became a symbol of the revolution’s triumph over the regime. To destroy this monument’s ability to stimulate people to remember this victory, the regime demolished it. And so did the regime with the first memorial to the January 25 martyrs that was constructed by the protesters, in Tahrir Square, immediately after Mubarak stepped down. In her work on East Berlin’s architecture, Jennifer Jordan explored how transformations in landscape planning can suppress or erase memories. In fact, in dismantling the revolutionary symbols, the regime intended to construct a collective memory that excludes rival interpretations of events to its own. That is reminiscent to the Bahraini government’s destruction of Pearl Roundabout, the rallying point of the 2011 mass anti-government protests. Likewise, the activists, also through demolitions, resisted the regime’s manipulation of the revolution’s memory. In November 2013, a few hours after Prime Minister Beblawi inaugurated it, protesters vandalised a memorial that the government built for ‘the martyrs of the revolution’. In his inaugurating speech, Beblawi referred to January 25 and June 30 ‘revolutions’ as well as the martyrs of the police and the army. That was interpreted by the protesters as another attempt to conflate the meanings and disrupt the image and the perceptions of the January 25 Revolution in the Egyptians’ collective consciousness. Some years earlier, every erased graffiti by the authorities triggered activists to resist and create more graffiti works. This resistance has recently waned. The unprecedented crackdown on dissent and the draconian laws that reportedly imprisoned tens of thousands of activists had prompted many to surrender the public space. Some are silent out of fear or disappointment. Others tried to put the memory of the revolution aside, so that they can go on with their own personal lives. Since the 2013 military coup, state and private media outlets – mostly controlled by the regime’s clientele – have kept glorifying the military’s role in recent years as well as defaming the revolution and activists as tools of the west to destroy Egypt. In 2016, Freedom House’s report indicated that ‘Egypt was the world’s third-worst jailer of journalists’. The regime punished any media outlet that strayed from its sanctioned narratives. With shutting down public spaces and mass media, activists reverted to where they started: the internet. An unknown online user once posted: ‘History used to be written by the winners. Now it is written by everyone.’ And so young Egyptians attempted to write their revolution’s history and resist the regime’s forced forgetfulness and hegemony over the people’s collective memory. Many tend to forget that tech-savvy young activists already utilised memorialisation to foment the democratic uprising. We Are All Khalid Said, a Facebook page created to commemorate the 28-year old Khalid Said who was brutally tortured and killed by police, in 2010, became the January 25 protests’ virtual rallying point and main coordinator. Other examples of online documentation and archiving efforts include Wiki-Thawra whose slogan is ‘so we don’t forget’; UCLA’s Tahrir Documents; AUC’s University on the Square; and MIT’s 18 Days in Egypt. That is besides various pro-revolution social media accounts and groups that keep battling the regime’s narratives and version of history every day. Persecution of the revolution’s supporters has dramatically altered how they perceive the future. Hope, that many embraced years ago, has given way to fear and disappointment. After the 2013 military takeover, thousands involuntarily left the country to live in exile abroad. A minority among the exiled are still engaged in telling stories of the revolution and protesting al-Sisi government’s human rights violations and destruction of Egypt’s democratic hopes. Using art and satire, they continue to disturb the regime’s hegemonic revolution-defaming narratives. It is true that in the rivalry over the January 25 Revolution’s story and memory, the ancien regime had the upper hand. Yet, the regime’s attempt to enforce forgetfulness of the revolution’s ideals and triumphant moments does not go unchallenged. Although they suffer immensely, and many of them try to forget in order to go on with their lives, some supporters of the revolution are still – using sarcasm, arts and archives – countering and disrupting the regime’s propaganda and false narratives, both online and abroad, while re-presenting the stories and memories of the January 25 democratic uprising. Despite the massive discrepancy of power between the opposing parties, it is still uncertain whether the regime has successfully dominated the Egyptian collective memory of the January 25 Revolution. That is because collective memory is not a static realm but rather a fluid construct that shapes – and is shaped by – current conditions and future aspirations. In today’s Egypt, millions are silent, nevertheless, they still remember.